We talk about making a bequest, but what is it really? The word “bequest” has its origins in Old English where a bequest was originally a transfer of personal property by will. The transfer was generally real estate and property rights attached to land. Today, a bequest can occur through any end-of-life transfer, not just through a will. A charitable bequest is a bequest written in a will or trust that directs a gift to be made to a qualified exempt charity when you pass away. One benefit of a charitable bequest is that it enables you to further the good work of an organization you support far into the future. Better yet, a charitable bequest can help you save estate taxes by providing your estate with a charitable deduction for the value of the gift. With careful planning, your family can also avoid paying income taxes on the assets they receive from your estate. A bequest is one of the easiest gifts to make. With the help of an adviser, you can include language in your will or trust specifying a gift to be made to family, friends or charity as part of your estate plan. To learn more about bequests and other estate plans fundamentals, request our in-depth book, "Provide and Protect" to be shipped at no cost to you. A retirement asset like an IRA account makes an excellent bequest to charity. If the IRA were given to your family, much of the value would be depleted through estate and income taxes. By designating the Texas A&M Foundation as the beneficiary of part or all of your IRA, the full value of the gift is transferred tax-free at your death and your estate receives a charitable deduction. If you wish to leave your IRA to your spouse at your death, you may also designate the Texas A&M Foundation as the secondary beneficiary of your account. Contact your IRA or retirement account custodian to obtain a beneficiary designation form and make a bequest from your IRA. An insurance policy can make a nice gift for Texas A&M. As an asset of your estate, an insurance policy is taxable at your death. However, if the policy is gifted to charity, your estate avoids paying tax on the value of the policy and receives a charitable deduction for the gift. Contact your insurance company to obtain a beneficiary designation form and make a bequest of your policy to the Texas A&M Foundation. Does any of this confuse you? These issues confuse many people, and that’s a prime reason why too many put off writing a will. IT is intimidating to some folks to set an appointment with an attorney and to discuss unfamiliar topics. Fortunately, you have the Texas A&M Foundation Gift Planning team. They can take the confusion out of bequests. The Gift Planning team is ready to personally assist in answering any questions you may have and provide information to help you along the planning process. 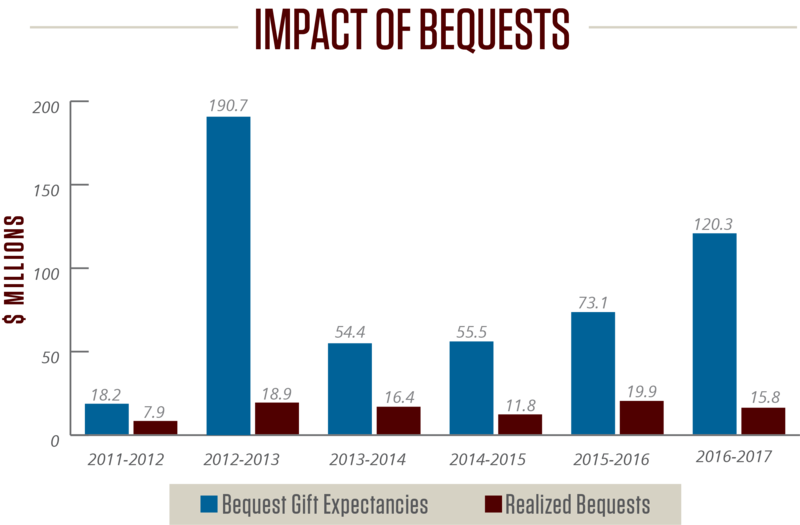 Bequests generate millions of dollars for Texas A&M each year. The Foundation received 48 bequests in 2011-2012; 70 bequests in 2012-2013; 82 bequests in 2013-2014; 77 bequests in 2014-2015; 85 bequests in 2015-2016; and 146 bequests in 2016-2017, resulting in a total realized bequest value of $90,573,863. After adding the Foundation's bequest language to your will or trust, you can specify that a gift be made to support Texas A&M students, faculty, colleges, programs or student organizations. View our bequest language here. If you have already made a bequest to Texas A&M in your will or trust but haven't notified the Foundation, please let us know by contacting Angela Throne.